There was a time, not too long ago, when Hollywood offering a token of science fiction with good production values and name stars was unusual. It was a dark time. As a result, I still get excited when I see a movie preview from the genre, despite the greater number of offerings. I saw the previews for this film and was really amped to see it. Real life delayed me, until this past weekend, but now I’ve seen it, and thought I’d go ahead and give my two cents about it. 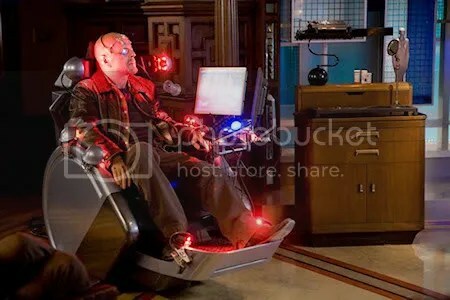 In a future world quite similar to ours, technology has allowed the vast majority of people to purchase robotic surrogates, physically perfect avatars, to interact in the real world. 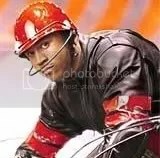 No more need to fear the dangers of the outside world, people plug themselves in and live through these machines in perfect safety. Even if the surrogate is damaged, the operator is perfectly safe. That all changes, though, when a college student is somehow murdered via their link with a surrogate. 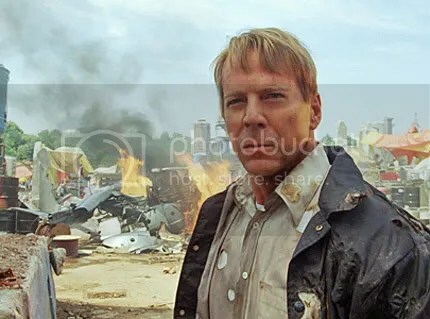 FBI agent Tom Greer (Bruce Willis) investigates the death, running into roadblocks from the company that creates the surrogates, the military, and those that rebel against the use of surrogates. The movie is based on a limited comic book series from Top Shelf Productions. I’ll admit, I haven’t read the comic book. I thought about seeking it out before seeing the movie, but I tend to believe that is a bad idea. Seldom to films live up to the source material, and I wanted to give this film every chance. At the start of the film, I was completely struck by the look of the characters. I would bet that underwear companies had to delay their ad campaigns while every perfect underwear model in the world worked on this film. That isn’t a knock against the film – it establishes very early on the feel of the movie, and artificial perfection, a “fakeness” that allows the premise that people living through perfect machines is plausible. In fact, this is reinforced when we meet up with the plastic version of Bruce Willis’ character. I don’t know what all they did to Bruce Willis to give us the plastic/perfect look that blends in with the underwear model cast so well, but it is impressive. And, when his character is forced to go without his surrogate, the grizzled, wrinkled, and bald look of the actual human behind the puppet is also great for establishing the contrast of the film. Unfortunately, one aspect of this compare/contrast demonstration didn’t really work. 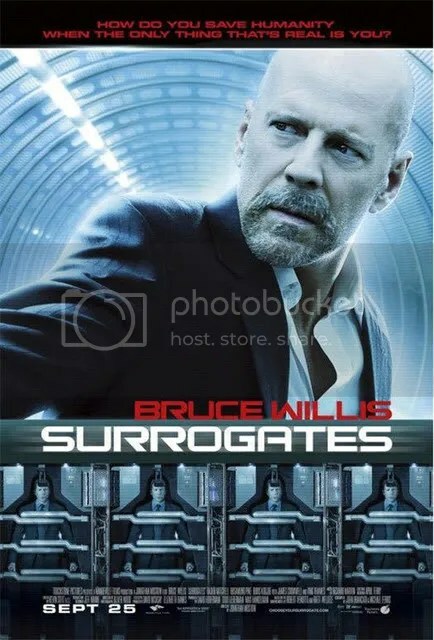 In the movie, there are those that are resistant to using the surrogates. Resistant is probably too subtle a term. “Violently opposed” is more accurate. They have been separated from the general populace in various camps. To emphasize the difference between these “real” people and the surrogates, most of the real folks are too real – sloppy looking, craggy, unkempt. It made me wonder, as I was watching, why none of the “real” people looked basically average. You can’t tell me that only the least attractive members of society reject surrogates. There have to be a couple of average folks mixed in, or it seems too black and white, which actually took me out of the movie. The movie does have several good action sequences, and I have no complaints about the effects within the film. And, with a running time of under 90 minutes, the movie certainly doesn’t drag! On the other hand, the film is pretty heavy handed in its moral. Not only does the main plot seem to revolve around the detachment of humanity, the sub plot of the relationship between Greer and his wife does as well. I think the makers of the film were trying to use the sub plot as a more personal reflection of the widespread issue of the main plot, but what results is the feeling of being hammered over the head in a “well, if you didn’t get the idea from that, how about this” sorta way. And, had the film stuck with the single social commentary of the detachment of humanity, I think they could have had a better product. Unfortunately, that non-dragging 90 minutes doesn’t really allow for the exploration of that theme, the violation of personal civil liberties, the question of justification in terrorism, and any of the other statements that the film failed to sufficiently elaborate on. The movie failed to really offer anything new, though. We’ve seen this same sort of story done before, both better and worse. The real problem with the film, though, is predictability. Every action seems to be telegraphed throughout the movie. Plus, I was able to figure out most of the film in the first five minutes, which is something I hate. OG tells me that this is partially my fault, because I never go into any book or film without overanalyzing as I go along. Maybe he’s right, but I still hate knowing how things are going to be put together at the beginning. Overall, the movie was okay. Nothing spectacular, but it wasn’t unwatchable. I wouldn’t recommend running out to the theater to catch it before it moves to DVD. It isn’t worth that. I’m going to give Surrogates two Running Steves. I don’t know that they could have really done enough to make the film great, but there was definitely room for improvement. By and large, I’m not a fan of remakes. I know the goal is to try to capture lightning twice, to get an easy “win.” All too often, a studio finds a perfectly good (often great) film, and proceeds to “update” it, making something that is, at best, pale imitation of the original, and, at worst, a two hour display of modern movie makers urinating on history. Sure, there is the odd occasion when a remake is actually good, and the extremely rare case where it is as good as the original, and the almost non-existant instance in which the update is better than the original, but, by and large, remakes are bad. I have long said, though, that if Hollywood wanted to really impress me, they shouldn’t try to remake great films, but, rather, lousy films. That’s right – don’t give me a remake of Planet of the Apes; give me a remake of Batman and Robin, a film so bad that it made me want to gouge my own eyes out while sitting in the theater. Anyway, time marches on, and, as is apt to happen, Hollywood is running out of “great” films to pillage, leaving lesser offerings. 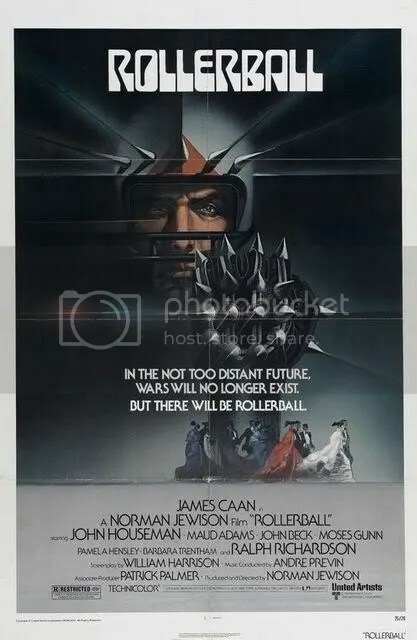 Rollerball was a film released in 1975 starring James Caan and John Houseman. Set in the year 2018, the world is ruled by several Corporations that control everything. 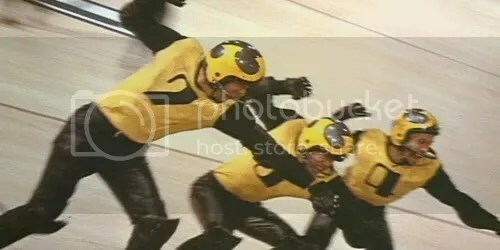 Rollerball is the sport of the future, a game designed by the Executives of the Corporations, to show that the effort of the single individual is pointless. 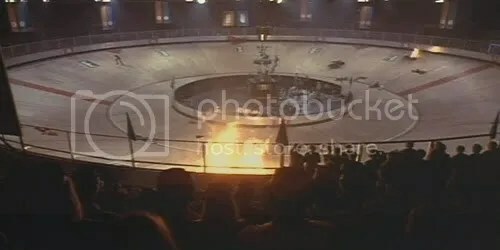 It is played on a circular track, with ten players on each team – seven skaters and three motorcyclists. As the teams move around, a steel ball about the size of a softball is shot out, roulette style, around the top of the track. The teams try to take possession of the ball and deposit it into a goal. Just that simple. Oh, and it is pretty much a no-holds-barred free-for-all in stopping the opposing team from scoring. The Executives face a problem, though. 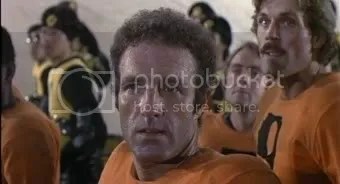 In a sport in which no individual is supposed to rise above the others, one has – Jonathan E.
Jonathan E., played by James Caan, is the premiere Rollerball player in the world, a ten-year veteran of the sport. The Executives decide that it is time for Jonathan E. to retire, and inform him. 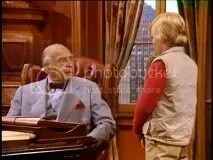 Though resistance to the will of the Executives is unheard of, Jonathan finds that he cannot bring himself to retire. 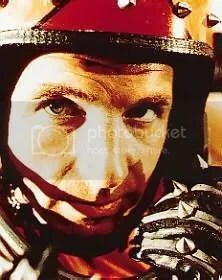 What follows after that is a steady stream of pressure on Jonathan to obey the will of the Executives, while Jonathan comes to a place wanting more from himself than the futuristic gladiator that he has become. 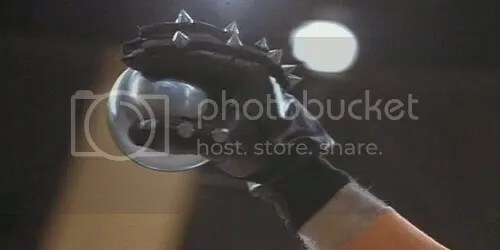 The movie culminates in a final Rollerball match in which – well, I don’t want to spoil the whole thing. Suffice it to say, the theme of the individual achievement versus sublimation to the rulers of society comes to a head. Sound good? Yeah, well, don’t get too excited. Now, don’t get me wrong – the movie isn’t horrible. 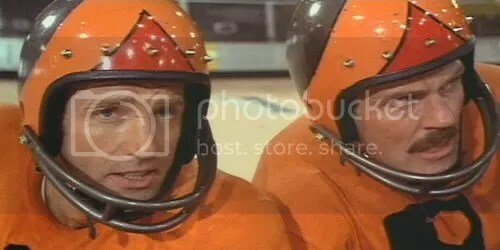 It is too long and hasn’t aged as well as some other films, but Rollerball’s biggest crime is that it is pretty much just slightly better than mediocre. What manages to keep this movie above that line is the acting. 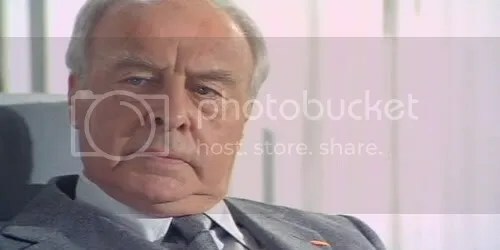 James Caan is good, though he seems to be trying to out melancholy Hamlet at times, and John Houseman, as the Energy Corporation Chairman, is very good. The theme of the film is a bit heavy handed, but handled well enough to inspire further thought on the matter even after the film is finished. Gone is that pesky futuristic world! This film takes place in the here and now! It is loud and in your face! And it is eXtreme! Yeah! 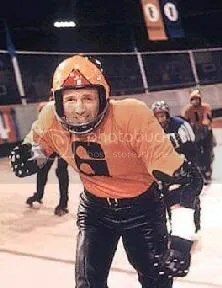 Okay, in this version, Rollerball is the big sport of the former Soviet republics. 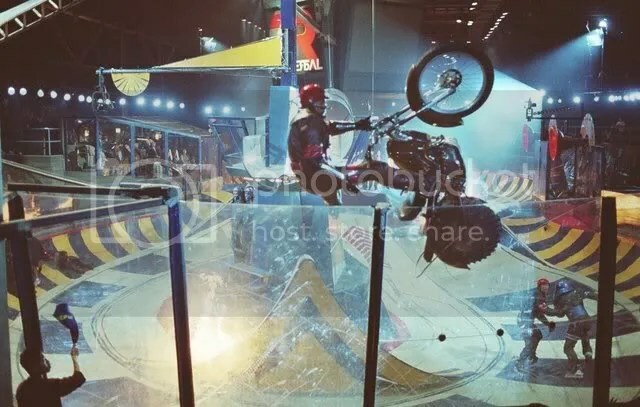 It is essentially the same kinda sport, but now played on a figure eight track, and the point of the game is not to send a message to the people, but, rather, to get ratings. And to display singer Pink on large screens around the arena. 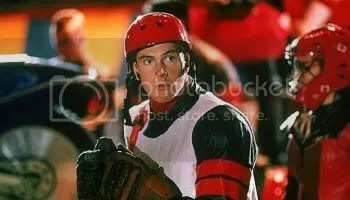 The star player of the sport is Jonathan Cross, played by Chris Klein. 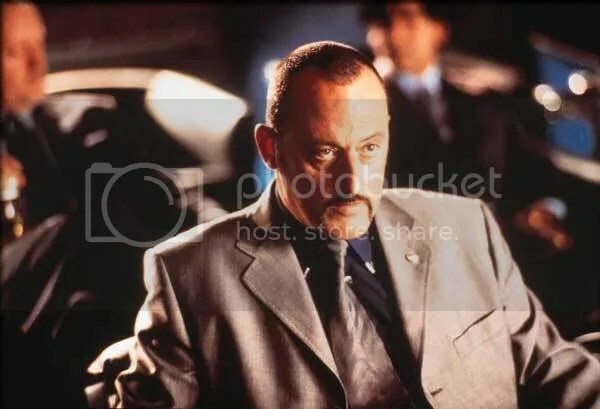 In this version, there are no Executives, but the sport is run by a crooked promoter played by Jean Reno. Evil looking, ain’t he? 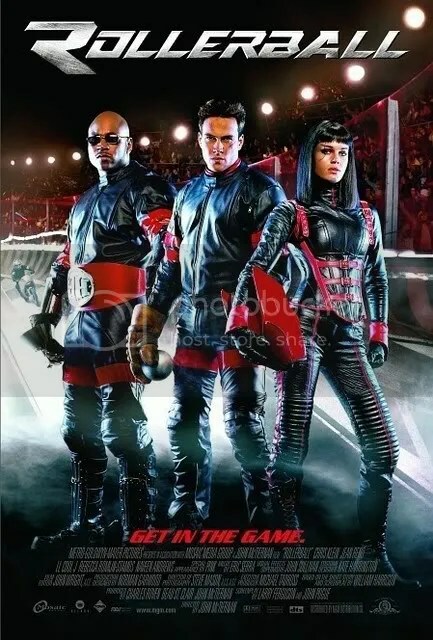 Oh, yeah, and LL Cool J and Rebecca Romijn-Stamos were in the movie, too. So, Jonathan Cross discovers that players are being set-up to die to bring in ratings, and decides that is wrong! 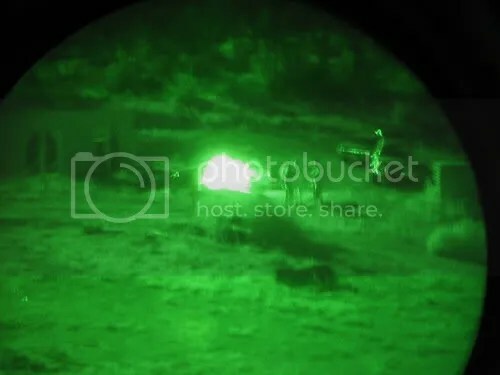 He and LL Cool J attempt to escape across a border, which is about 20 minutes of your life you’ll never get back filmed entirely in glorious, grainy night vision. 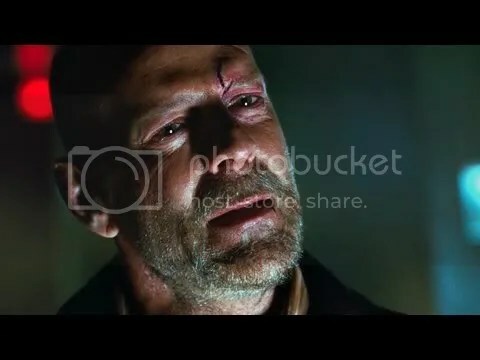 Eventually Jonathan Cross is captured and forced to play. Of course, he is now the next target to encourage increased ratings. At this point, a film that was barely making any sense degrades into Jonathan Cross somehow starting a social revolution. And, what did the re-makers manage to do with this film? 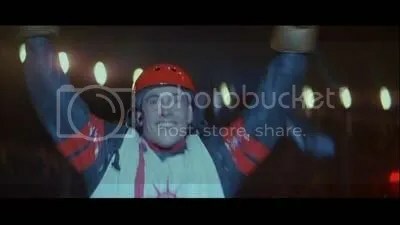 They took the heavy handed, yet still thought provoking theme of the original film of the individual achievement versus sublimation to the rulers of society and replaced it with an even heavier handed theme of greedily capitalizing on society’s bloodlust, a theme that requires no thought. They replaced good actors (James Caan, John Houseman) with actors whose abilities remind one of cardboard. Seriously, Chris Klein couldn’t inspire me to blow my nose, let alone revolt against the powers that be. And, speaking of, the images of Chris Klein so far have been awfully fierce looking. I mean, come on! 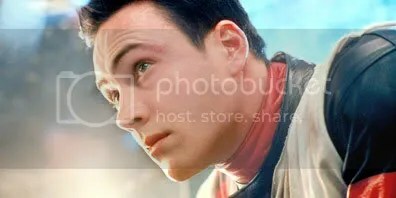 The Chris Klein we have come to know is that dopey looking Keanu Reeves kid. Remember? Where is that guy? Oh, wait. Found him! Yep. That’s the dopey guy we know. Thankfully, the 2002 version is much shorter than the original. Unfortunately, it feels twice as long when you are watching. So, while the original film isn’t the greatest, it is a masterpiece compared to the updated version. 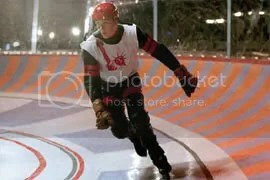 On a closing note, the basis of these films was a short story called Roller Ball Murder. 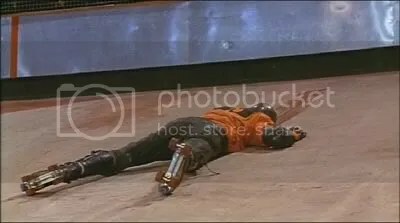 Aside from the ridiculous name of the sport (yeah, “Roller Ball Murder” is the name), it is actually quite good – a first person narrative from the viewpoint of Jonathan E., very much the story of a weary, futuristic gladiator. If you have about a half hour, you can listen to the whole thing, courtesy of radio show from the ’70’s, MindWebs, the episodes of which have been archived in MP3 form on the internet!